Sitting here at the stalls this beautiful February morning I can not feel more blessed. I have my fiancé by my side, my mom and dad on the road headed here and my protege headed here to help fit. The cattle in front of me are the best that I have raised and are of the best breed I know. If you can’t make it to Des Moines and want to bid on some great Hereford cattle today go to LiveAuctions.tv and register to bid. Also selling at the Iowa Beef Expo will be JJB Show Goes On 8Y. Shelly as we like to call her has been a favorite since the day she was born. She came into the world a 72 lb wonder that had the widest stance I have seen on a calf. At that time I thought man if she grows into that I really have something here and boy has she ever. Her mother is a Lucky daughter sired by Bogart and will likely be the first cow flushed at our place. This heifer will compete in the horned shows and is one that will produce great calves for years to come. If you have any questions about Shelly or any of the other calves please don’t hesitate to contact us! THE Hereford Show Heifer You Need! 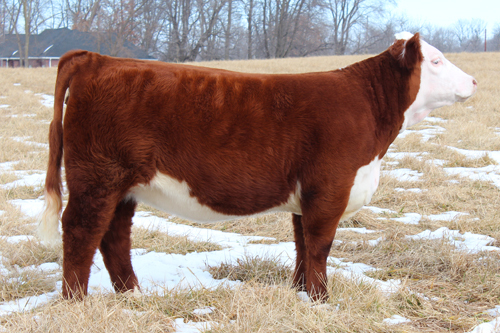 JJB Firework 7Y will sell on Thursday, February 16th at the Iowa Beef Expo. This is one that can be called a “show stopper”. This heifer has tons of depth and capacity with a nice thick top and enough bone to satisfy even the pickiest Steer Jock. Speaking of Steer Jocks once the Hereford Association rolls out the new genomics deal and we can do parentage testing on these steers at Jr. shows you may want to have a real Hereford momma on the bottom of the pedigree and this is your girl! Check out the video below and if you have any questions about Firework please feel free to go to the Contact tab on the site and get a hold of us. Click Here to go to the For Sale page to view the videos of each of our consignments to the Iowa Select Hereford Sale. Catalogs are in the mail! The Sale Catalogs for the Iowa Beef Expo – Iowa Select Hereford Sale are in the mail. You should be getting yours soon and if you are coming to this site because of the picture on the back or any of the current ads I want to say thank you so much for your interest. If you have any questions please utilize the Contact section of the site and get a hold of me however you like. The cattle that we are selling have been a true joy to raise and have grown and developed far better then I ever could have dreamed. These animals will be very hard to sell on the 16th of February but I know they will work for their new owners and hopefully create repeat customers. Please take a look at the For Sale section of the site for information regarding each of the sale animals. We will try to get you some updated pictures and videos of each before the sale! The snow is falling heavily here in Independence America and all I can think about is get in the barn and rinsing calves this weekend. I had planned on getting after it this week but with the -0 temps I have laid-off and let them stay as dry as possible. But dang do they look great. The heifers have put on more mass in a short amount of time then any I have feed before and the bull is growing like a weed and will definitely add pounds to whatever operation he is put in. Once Crystal and I get the calves in and get a little clipping done we will snap a quick picture and let you see the progress. I think you will be impressed. All is possible. As I sit in Chicago O’Hare Airport waiting on my flight to Cedar Rapids and reminisce on another great Denver it seems the sky is the limit. The yards were absolutely packed this weekend with people trying to get a peak at the latest greatest small hooved, slow growing, fluff ball. And the Hereford show on The Hill was once again one of the most heavily attended. The city of Denver has given me some the greatest gifts I could ask for and it goes far beyond trophies and banners. I have a tremendous support system that has been gained largely by the time spent at the National Western as well as the best fiancé I could have ever dreamed of. We already have some of the best cows I could ask for and when you combine them with our individual talents the realm of possibility is greatly increased. My dream is to make as big of an impact on the Hereford breed as it has on my life. Seems like something that is close to unattainable but then again nothing is impossible. Star Lake Champion Carload In The Ring!!! Today Star Lake Cattle Ranch exhibited the champion Hereford carload at the National Western for the 13th year in a row. This is clearly unprecedented and something that is extremely special. My dad and grandpa hands down have the best crew and cattle that we could possibly ask for and are truly blessed. You think farmers are hillbillies? Sit down son.